What are the basic ways of heating an aquarium? 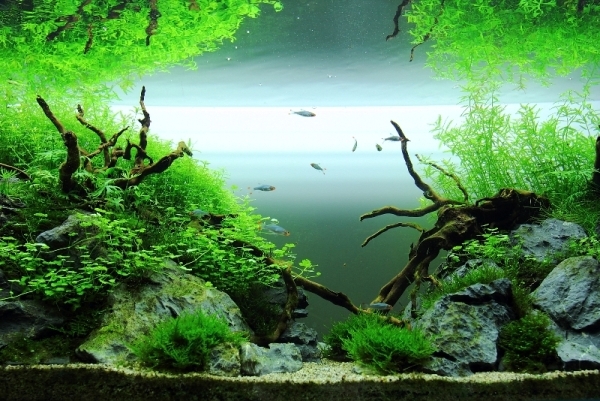 Along with filtration, heating is among the most important considerations for fishkeepers. The majority of freshwater species that we keep in our aquaria are found geographically in the area between the Tropic of Cancer and the Tropic of Capricorn (23° north and south of the equator respectively), hence the term ‘the tropics’ and therefore ‘tropical fish’. Ambient temperatures in the tropics rarely fall much below 68°F/20°C, at least for any sustained length of time. Additionally temperatures in the tropics have little seasonal variation. Even in a modern, centrally heated home, temperatures regularly fall below this minimum level in many countries, meaning that to keep successfully any tropical fish species a heater is required. When considering heating requirements, it is important to think about the fish you intend to keep. If your intention is a general community tank with a variety of fish, then the required temperature will always be a compromise that suits all the different species you plan on having in your tank. In general, the majority of commonly available community species will be perfectly happy in a tank where the temperature is somewhere between 70 – 82°F/21 – 28°C. If you intend to keep a particular species or group of fish then it is good practice to aim for a temperature as close as possible to that which the species would live in naturally. For example, some species do best at temperatures in excess of 30°C/86°F while others prefer cooler temperatures of 20°C/68°F or less but all are traded as suitable for the ‘tropical’ aquarium. It is advisable to research the requirements of individual fish when planning your overall setup. Many species will tolerate temperatures outside their natural range, but the aim should always be to replicate the conditions they would experience in the wild as it is only then that they will thrive. A vital complement to a heater is a proper thermometer but avoid the ‘stick-on-the-glass’ type since these are easily influenced by ambient temperature. Simple, submersible, glass aquarium thermometer are cheap to buy, accurate and sufficient for the needs of most fishkeepers. In terms of heating equipment there are a number of options available, and we’ll consider each in turn. The combined heater/thermostat is the near universal piece of equipment that most aquarists use to heat their aquaria. The heaterstat, as it is commonly known, is an automatic device that measures the temperature of the aquarium and turns the heater on and off, as required, until the desired temperature is achieved. Most heaterstats come with a dial that can be used to select the desired temperature. Heaterstats are available in numerous sizes and wattages and are therefore suitable for the majority of standard sized aquaria. The wattage of the heater should be equivalent to or slightly more than the aquarium volume in litres. With larger tanks, it is good practice to use two or more heaters as this facilitates a more even heat distribution and also provides a back up should one heater fail. This could also be considered for smaller tanks, for example you may wish to consider having two 150w heaters in your 48″ tank. This also reduces the risk of your fish being killed if a heater sticks in the “on” position, as it would take longer for the tank to reach life-threatening temperature levels. When using a heaterstat for the first time (or if you are using a unit that has been out of the water for some time) it’s a good idea to check how accurate the temperature scale is and to test i that it’s working properly. Fill a (preferably plastic) bucket and install the heater using the suction cups to attach it. Select a temperature value around the middle of the range covered (77°F/25 degrees °C, for example) and leave the unit for a few hours before checking the temperature with a thermometer. Heaterstats normally have a minimum water-level marked on them, and the unit may crack or fail completely if exposed below this recommendation. Some models now come with an automatic cut-off system but this should not be replied upon as a failsafe. When doing any kind of maintenance that involves removing the heater or dropping the water below the recemmended minimum level always unplug the unit and leave it to cool for 30 minutes. 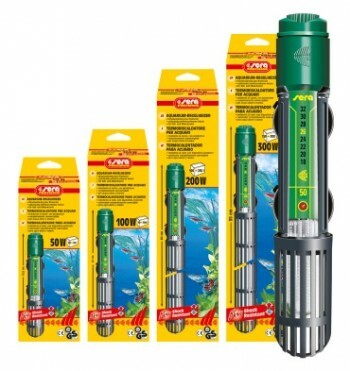 For very small aquaria there are also mini-units in the 7.5-25 watts range. Most of these do not feature an adjustable thermostat but are fixed at 77°F/25 degrees °C, and build quality, particularly the internal thermostats, can be somewhat unreliable. A relatively recent development in heating technology has been the in-line heaterstat. 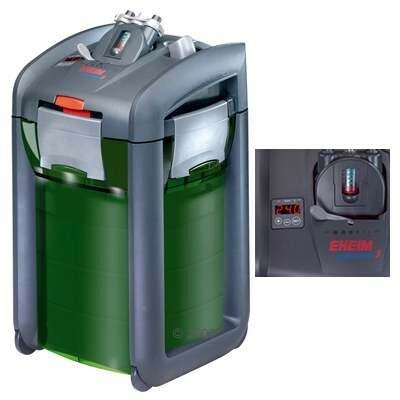 This device functions in much the same way as described above but the main difference is that the unit sits outside the tank. This heater can only be used where you have an external filter as it is designed in such a way that the output from your filter is directed through the in-line heater and back into the tank. The inline heaterstat is a sealed unit with a connector for the water input hose at one end and a connector at the other end to attach a hose to direct the water back to the aquarium. This type of heater, although more expensive than a standard heaterstat, is an excellent idea if you have large fish such as cichlids and catfish that may attack or otherwise damage any internal equipment. Thermofilters are similar to inline heaters in that they remove the actual heating unit from inside the aquarium. As the name suggests, thermofilters combine the heater and the filter into one piece of equipment – in this case, an external filter. 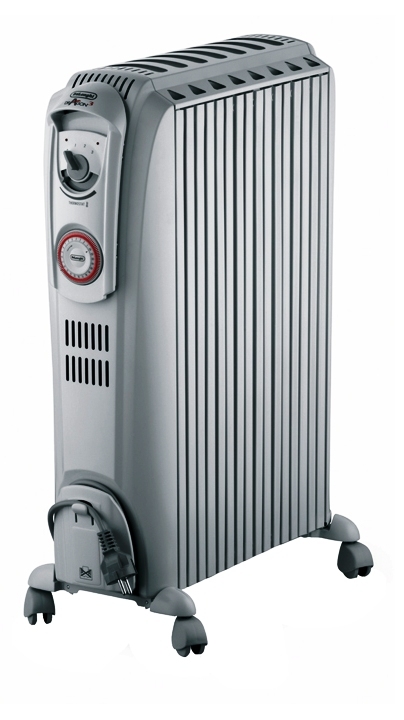 Eheim are the main manufacturers of this type of heater/filter, although some other companies are starting to follow suit. In this arrangement, the heating element is built into the filter and water is heated as it passes through the device. There is a separate temperature probe which is placed into the tank and connected to the heater via a wire. Temperature can be adjusted via a control panel. As with inline filters, thermofilters are a good way of removing as much equipment as possible from the tank. The disadvantage of thermofilters is that they cost considerably more than purchasing a heater and a filter separately. Additionally, if you are running a marine tank, you must ensure you purchase a model that is compatible with saltwater. The final option we will consider is space heating. This solution is only suitable for the fishkeeper with several tanks in a single room or shed and is unlikely to prove cost effective unless there are at least a dozen tanks present, depending on the space. Rather than heat each tank individually, space heating involves heating the whole area. This can be achieved in a number of ways but the best way to heat the room is by using a thermostatically controlled electric heater such as an oil-filled radiator or an electric fan heater. This can potentially be a very expensive way of heating your tanks, so it is imperative that the room in which they are situated is very well insulated. Materials such as Kingspan, industrial grade polystyrene, cavity boards and Airtech insulation are all good options. Consideration should also be given to covering any windows in the room or shed, although double glazing will help mitigate this. The disadvantage of space heating is that all tanks are maintained at the same temperature. One way round this is to heat the room to the minimum temperature required and then place a heaterstat in any tanks requiring a higher temperature. What should I do if my heater fails? In many cases there is no need for immediate panic. A tank in the average modern home will lose heat very slowly and many fish species can handle a gradual drop in temperature without problems (in some it may even trigger spawning!). If you do keep sensitive or heat-loving species it can be a good idea to have a spare heater in stock just in case, however. If a power outage lasts longer than a few hours it’s a good idea to wrap the tank in insulating material; plastic bubble wrap or even blankets work well. Heaterstats can be unsightly devices that can spoil the visual effect of a carefully aquascapes aquarium. If unprepared to buy a more expensive inline device you can camouflage your unit by planting around it or placing some wood or other décor in front of it. Ensure that there is sufficient water movement around the unit, and if planting closely or stocking fishes that like to hide it’s important to install a heater guard to prevent them being burned. Many thanks to Jeroen Wijnands for comments and additions and Steven Gielis for suggestions.